Lemon laws are consumer protection laws that provide remedies to consumers who have been given defective goods. The name dates back to the 1960s when new cars with several manufacturing defects were referred to as “lemons”, and laws were passed to combat a proliferation of said cars. Over the years, the term “lemons” has taken on a much wider meaning and now refers to any goods that fail to meet a satisfactory standard established either by contract or by law at the time of performance. Singapore’s lemon law is a recent creation. It comes in the form of amendments to the Consumer Protection (Fair Trading) Act (the “Act”) that came into effect in late 2012. You can find the relevant provisions at Sections 12A to 12V of the Act, which can be accessed online by the general public here. 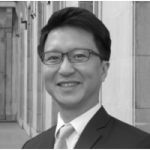 Apart from containing Singapore’s lemon law, the Act also allows consumers to seek civil remedies against certain recognised unfair trade practices. It confers additional rights in respect of (i) contracts for sale of goods, (ii) contracts for the transfer of goods, and (iii) hire-purchase agreements, all of which we will come across in our daily lives e.g. buying a vacuum cleaner or a car for the family. What does the lemon law cover? 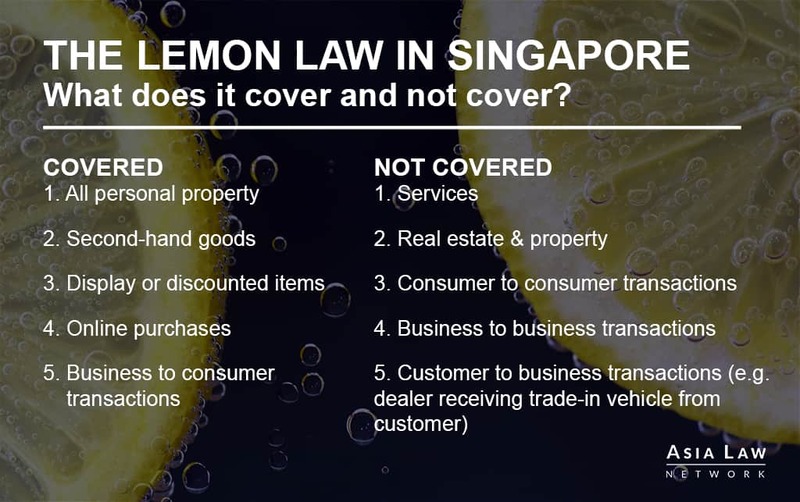 Singapore’s lemon law applies to all general physical goods purchased in Singapore with the exception of real property and rental/leased goods. Items as small as stationery are protected together with bigger items such as cars and electronics. Services are not covered by the lemon law. Both new and second-hand goods are covered, but the age and condition of the latter will be taken into consideration as it will affect the remedies available to the consumer. Consumers who buy discounted or sale items are not excluded from protection. A seller cannot escape his obligations under the lemon law merely by putting up a general notice stating “no refunds under any circumstances”, “sold as it is”, or “non-refundable/exchangeable items”. He or she must clearly point out the defect to the buyer before the transaction takes place, i.e. through appropriate labelling and disclaimers in a sale contract, invoice, or packaging. If the seller has taken the correct steps to highlight the defect to consumers before parties “seal the deal” OR if the defect would have been revealed during a pre-purchase inspection, then consumers are not able to rely on the lemon law to seek redress for defective goods. the contract was concluded in Singapore and/or is governed by Singapore law. The lemon law does not cover individuals who contract in a business capacity (i.e. private-hire cars) or individuals who contract on behalf of a company. It also does not cover purchases. Similarly, private sales between individuals (e.g. through classified ads) are excluded from protection. As consumers, you can make a claim under the lemon law for goods (as described above) that are (a) found to be defective, or (b) “not conforming to the sales contract at the time of delivery” within six (6) months of sale or delivery. However, should you only discover the defect more than six (6) months after sale or delivery, you are not barred from relying on the lemon law. However, you would have to prove to the court that the defects or non-conformity existed at the time of delivery. The court will not assume that they did. When is a product defective / when does it not conform? A product is defective if it does not conform to the sales contract at the time of delivery, i.e. it is what you contracted for and/or it does not fulfil the standards of what the law has been defined to be “reasonable quality”. To put it simply, an item is of satisfactory quality if a reasonable person thinks so, taking into account any description of the item, the price (if relevant), and all other relevant circumstances. You have to prove that such standards have not been met. The availability of the remedies above is dependent on whether there are existing manufacturers’ or distributors’ warranty services. If there are, the seller can provide remedies under the warranty services first. The consumer is not allowed to refuse them and demand, for example, a full cash refund instead. You buy a reputable brand kitchen mixing-stand for S$800.00. The mixing attachment breaks the first time you use it. You bring it to the seller, who advises you that it can be repaired because the supplier has covered it under a 3-months warranty. The seller says that he will send it to the supplier’s workshop and collect it on your behalf. He also says that he will call you when it is ready. Since there is a warranty and the seller has opted to provide a remedy under that, you cannot ask for a new mixing stand or full refund. Stage 1: Assuming that there are no warranty services, you can first ask the seller to either repair or replace the defective item within a reasonable time provided that it is not impossible or unreasonable to do so. The repair or replacement should also not be significantly inconvenient to you, the consumer. All necessary costs incurred as a result of the repair or replacement are to be incurred by the seller. Stage 2: If a replacement or repair under Stage 1 is not possible, the consumer can then (a) keep the defective item and request for a reduction in price OR (b) return the defective item for a refund (the seller can propose a reasonable deduction from the refund for the use that you have had of the item). Any refund of monies is to be made in cash, or using the same mode of payment as the original transaction. Therefore, if a seller offers you vouchers, you are not obligated to accept them. You bought a reputable brand kitchen mixing-stand for S$800.00 in cash. The mixing attachment breaks the first time you use it. You bring it to the seller, who advises you that there is no warranty offered by the supplier for the item because it is a discontinued item. Because of the latter, he also has no more stock of the item left. The seller then says that he can repair it but it will take 8 months and you would have to order the parts yourself online from USA. Otherwise, sending it for repair with the supplier would cost S$1200.00 and he is not prepared to undertake that cost because it is not reasonable. Repair by the supplier is disproportionately costly (150% of the purchase price). As you paid in cash, the seller must also pay in cash. He cannot offer you vouchers unless you are willing to take them. When are you unable to make lemonade? you changed your mind about buying, or found the item unsuitable for a special purpose that was not pointed out to the seller. Apart from the Act, there are other remedies available to a consumer e.g. the right to reject non-conforming goods under common law and remedies under the Sale of Goods Act. You can read more about these remedies here. Therefore, do not be discouraged if you find, at first glance, that your situation is not covered by Singapore’s lemon law. Did you buy a product, or a service? Did you buy the product in Singapore from a registered company? What kind of defect is there in your item, and how was it caused? Does the defect make your item different from what was promised to you in the contract? Putting yourself in the shoes of a third-party, do you think it is reasonable that Have six (6) months passed since you bought the product / the product was delivered? If yes, do you have pictorial proof that there was a defect at the time of delivery or purchase? Have you tried to arrange for a repair/replacement? Have you tried asking for a refund? In any case, if the seller refuses to make good of the defect, or should you be in any need of guidance or clarification at any stage on whether your claim is reasonable and supportable under the law, it would be helpful to approach CASE, or a relevant practising lawyer. A tourist purchased an item from a shop in Singapore. However, the item purchased had a defect and he would like to exchange or get a refund. As the customer is no longer in Singapore, does Lemon Law still applies and if yes, does it mean for retailers to bear shipping fees etc? Request him/her to produce proof of purchase. Whether the costs of repairs/replacement and shipping fees are reasonable compared to the value of the item. Under s 12C(2)(b) of the Act, a seller must bear any necessary costs of repairing the item including the cost of any postage. However, if the cost of repair/replacement and postage together far exceed the item bought by the tourist, a seller can refuse to repair or replace the item and instead, refund it or offer a reduction in price. Do also take note of when the tourist bought the product, and when he/she is making the claim on you. If more than 6 months have elapsed, the tourist will then have to prove that the defect was there when he/she bought the product. The court will not assume that the defect was there. Have a question on the Lemon Law? If you have a legal question about the Lemon Law, you can get a Quick Consult with Kah Hee or other lawyers. With Quick Consult, you can check out in minutes and for a transparent, flat fee of S$49, the lawyers will call you back on the phone within 1-2 days to answer your questions and give you legal advice.